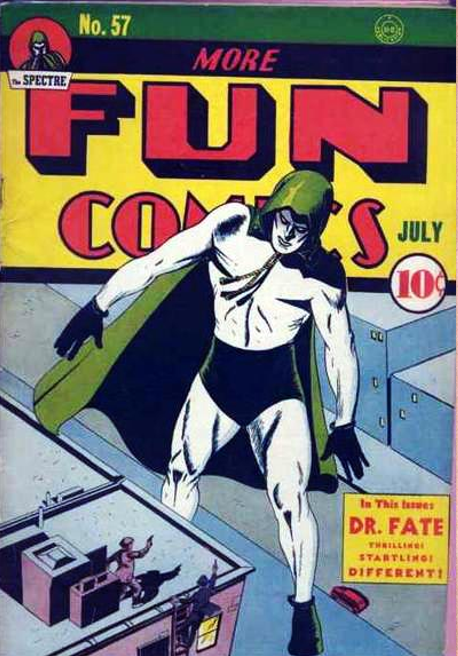 The final Spectre story to be a cover feature, the Jerry Siegel/Bernard Bailey tale from More Fun 67 (May 1941) has the Spectre at the mercy of Deeja Kathoon. Kathoon is able to control ghosts, and many appear in the tale, all dressed much like the Spectre, though their robes cloak more of their bodies. 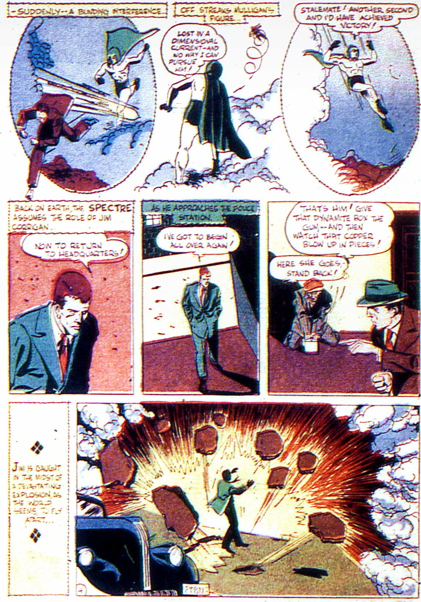 Jim Corrigan is assigned to solve a series of mysterious vanishings, which were also the work of Kathoon. 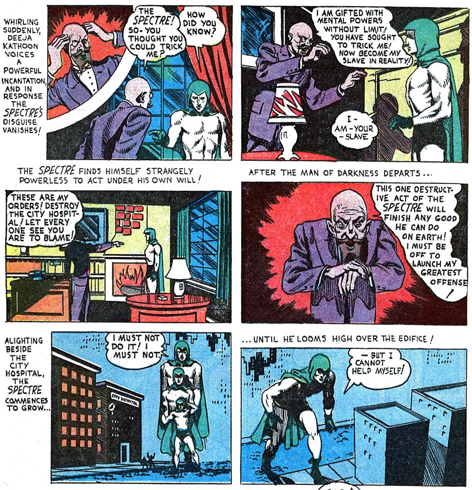 As the Spectre, he disguises himself as a regular ghost, in an attempt to get near the villain, but his “disguise” is seen through. Not too hard, as he looks like he has just pulled his cape around himself. 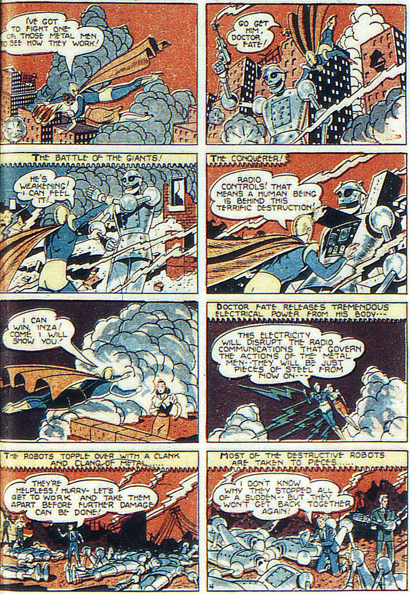 Kathoon takes control of the Spectre and sends him on a destructive rampage. The Ring of Life seems to have a consciousness of its own in this tale, appearing out of nowhere to free the Spectre, who turns on Kathoon and chases him into another dimension. 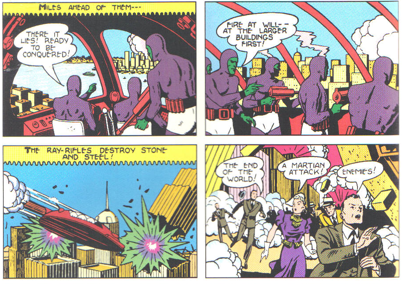 Interestingly, when no longer on Earth, Kathoon adopts the purple cloaked garb that has previously signified a vengeful ghost in this series. Is Kathoon really alive, or some sort of malevolent and powerful spirit? 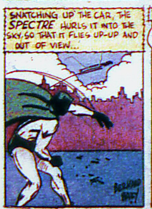 It’s moot point, as the Spectre hurls him to his death. Another potentially recurring villain bites the dust. 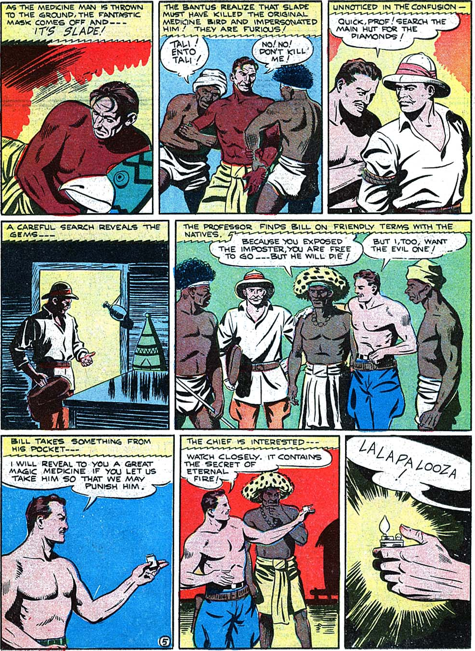 Congo Bill’s final outing in More Fun has the best art of his run, and one of the most racist stories. 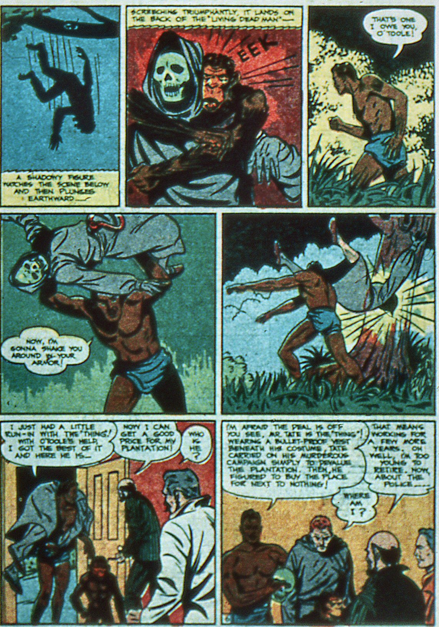 Bill and Professor Kent pursue a diamond thief named Slade, and get captured by Bantu warriors. 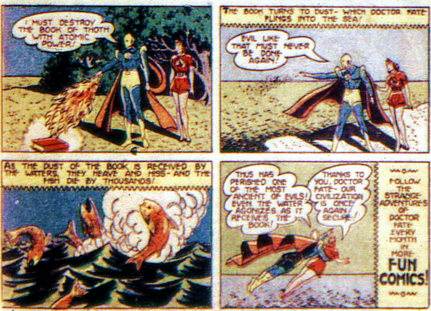 Their chief turns out to be Slade in disguise, and Bill is allowed to take him back in exchange for “the secret of eternal fire’ (a lighter). Oh, those easy to fool Bantu warriors. 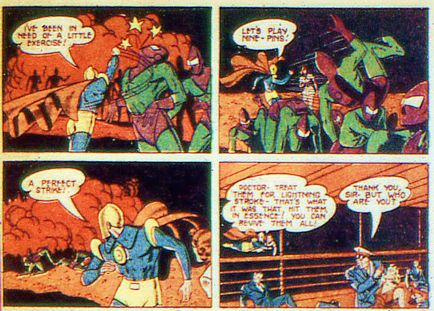 At least Slade gets a grisly death. That improves things a bit. 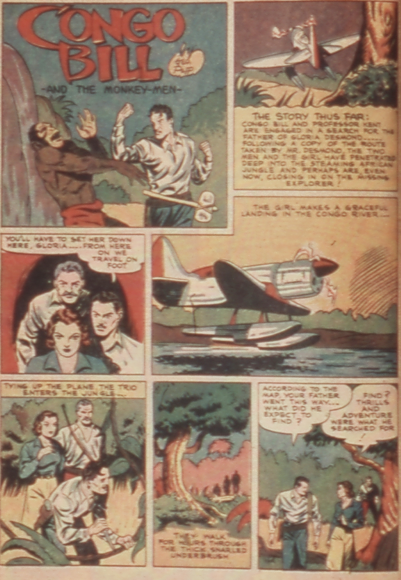 Congo Bill’s series moves over to Action Comics, with Professor Kent tagging along. Lance Larkin heads to Saigon in his tale. 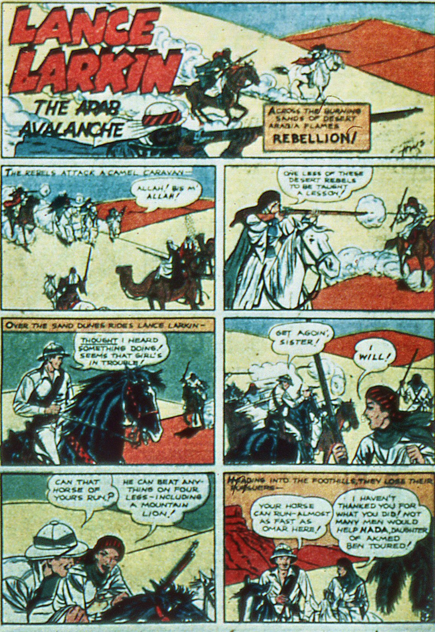 While his second story kept him among the Arabs, the previous issue saw him in Rangoon. He gets his horse shipped to him, but now the horse is called Satan. Whatever happened to Omar? Did he rename the horse? The story makes it clear he has owned this horse before, it is not a new one. Heading inland, he encounters the neice of a dead explorer. She tells him of a forgotten tribe of dragon-riding cavemen. The dragons seem to be somewhat evolved dinosaurs. Together they seek out the tribe, and she and Lance get to ride some dragons. Then they leave, promising to keep the secret of the tribe. Dr. 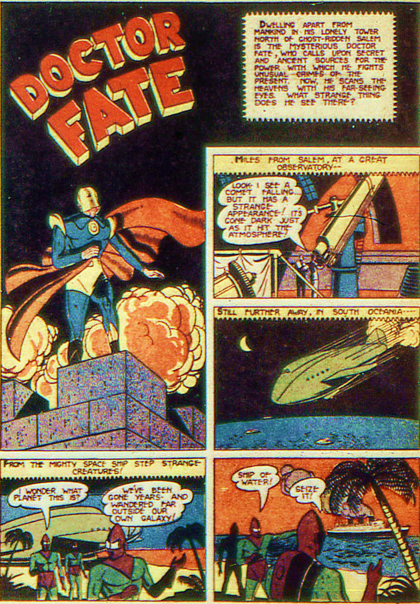 Fate is finally given an origin story in this issue, by Gardner Fox and Howard Sherman. 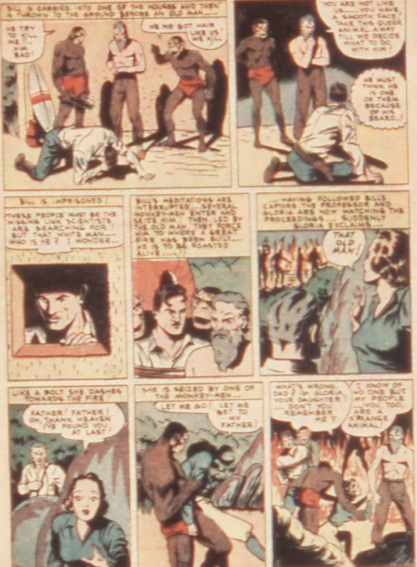 Young Kent Nelson accompanied his archaeologist father on an Egyptian dig. The boy came across what appeared to be a statue, but was actually the form of Nabu, and ancient being from a wandering planet called Cilia. I always found it weird that there was an alien aspect to this character, and that’s generally ignored, or re-interpreted as a mystical dimension. 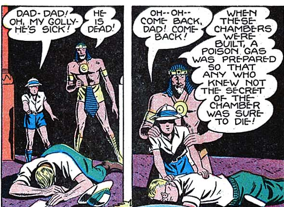 Kent’s father dies from poison gas, and so Nabu raises the child, training him in his arcane knowledge and abilities. Was Nabu responsible for the father’s death? It is not stated that way in this story, but it certainly seems to be the case, even indirectly, and later stories would lay the blame more strongly on him. 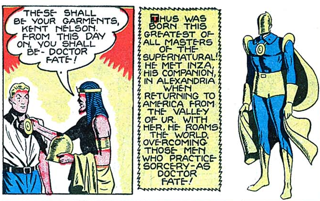 Nabu gives Kent Nelson the garb of Dr. Fate. At this point, there is no indication of Nabu taking residence in the helmet, that was a much later development. The last few pages of the story return to the present, as Inza attends a society party at which a man is threatened by shadowy beings. She calls on Fate, who traces the shadows to the underworld, and takes Inza along because…the party was getting dull, maybe? 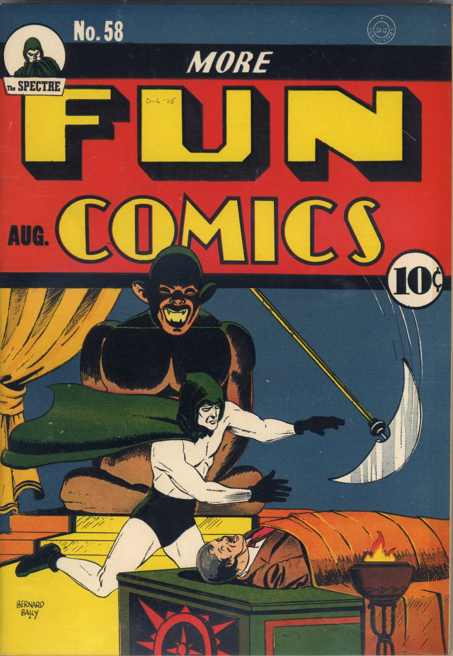 There they face off against Nergal, a lord of the underworld who gets cowed by Fate pretty quickly. All he has to do is threaten Nergal and he backs down. Still, the origin story is good, the best Dr. Fate story to date. 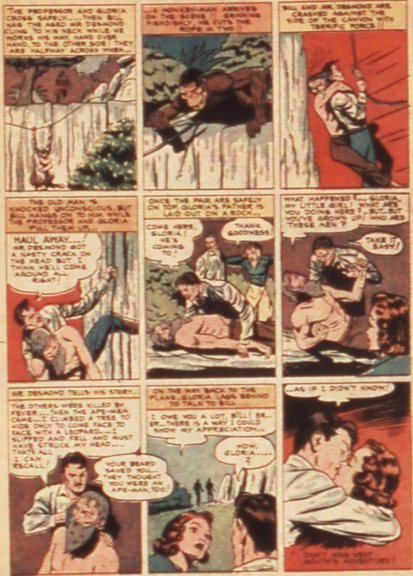 Jerry Siegel and Bernard Bailey craft an almost identical tale to the previous story, in More Fun 64 (Feb 41). In this case it is the witness to corruption by a political “boss” who gets murdered, with his ghost seeking vengeance on his killers. I do like the use of the shadow form to show the ghost. 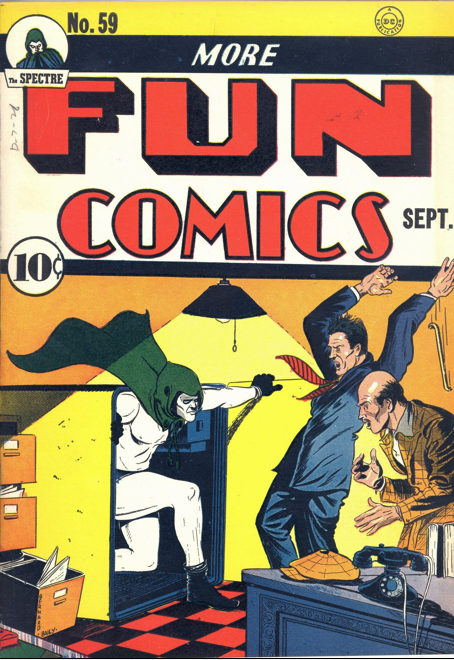 As before, the murderous spirit knocks off a few people before the Spectre gets around to trying to stop him. 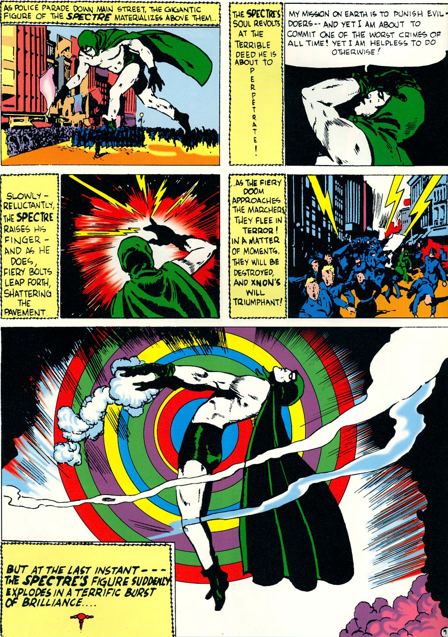 And, once again, the Spectre finds that his powers are useless against someone who is dead, and resorts to the Ring of Life to banish the spirit. 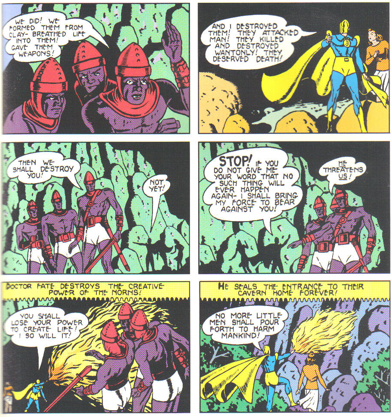 And in the climactic scenes, instead of showing the ghost killer as a shadow, he is wearing purple robes, almost identical to “Trigger” Daniels. 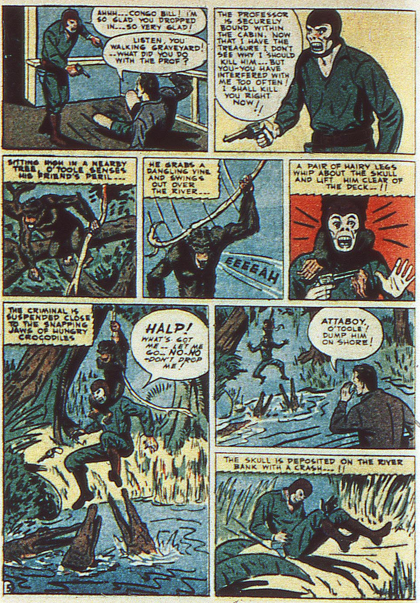 Congo Bill’s chimpanzee sidekick, O’Toole, makes his third and final appearance in this story. Professor Kent is still around, but does little in this tale. A plantation owner asks for Bill’s help after a mysterious entity calling itself The Thing repeatedly kills his slaves, I mean, African workers. 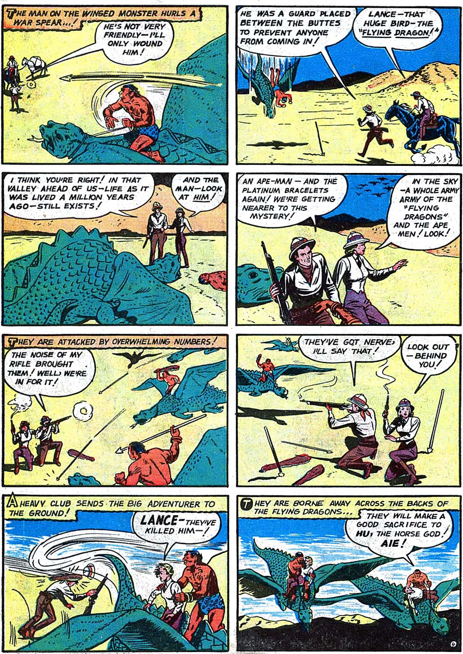 In their first encounter, Bill discovers that The Thing is apparently immune to bullets, but figures that it must be someone in armour, rather than a supernatural creature. 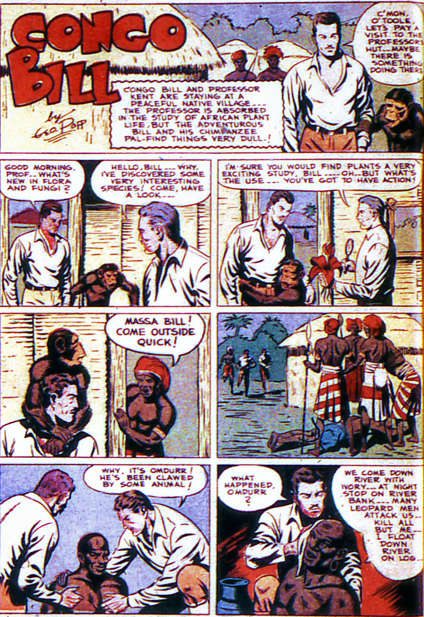 So, Congo Bill does the only rational thing, and disguises himself as a black man. Yup. Even still, it’s O’Toole that grabs the Thing, although it’s Bill who throws him into a tree, and unmasks him as a speculator who had been trying to buy the land. 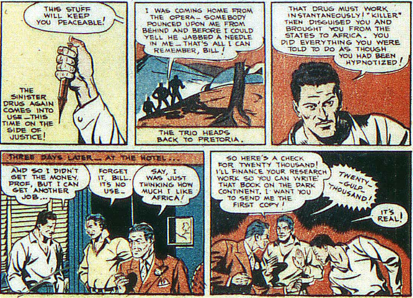 Not a terrible story, and not nearly as racist as it might have been, but still uncomfortably close to the edge. 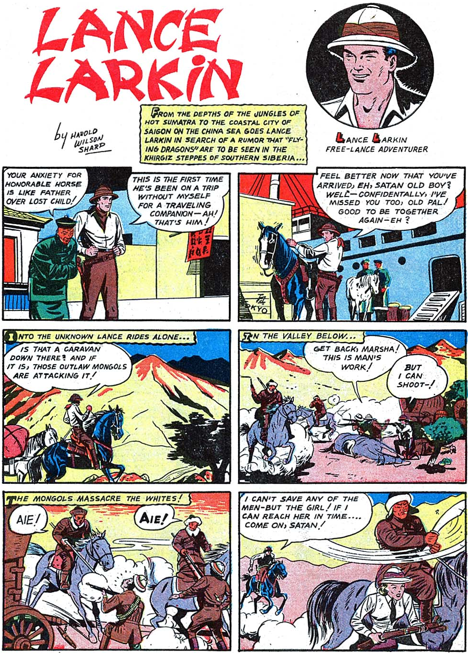 Lance Larkin debuts in this issue, an American adventurer in the Middle East. Not much is ever established about the character. He has a horse named Omar. In his first outing, he is in the middle of a war between rival arab groups. 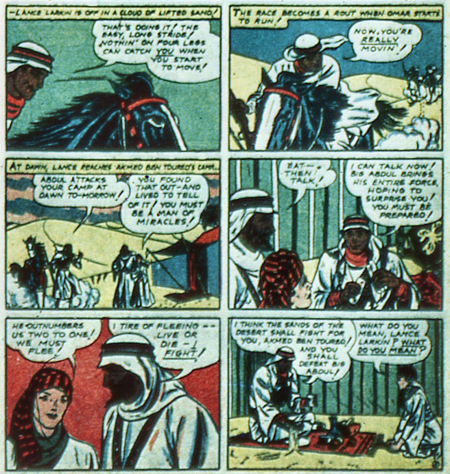 In some of the panels, Lance looks to be the same colour as the arabs. Whether this was an accident, or meant to imply a tan, is unclear, though I suspect the former. While the stories in this short-lived series are not that bad, there is little memorable about the character, simply because there is little that makes him distinctive. Mayoor is not shy about letting Dr. Fate know what he is up to, sending him a message in his tower. It turns out these are old foes, dating back to the 1400s it seems. Dr. Fate defeated and imprisoned Mayoor long ago, and by implication this occurred during the heyday of the Mayan empire. 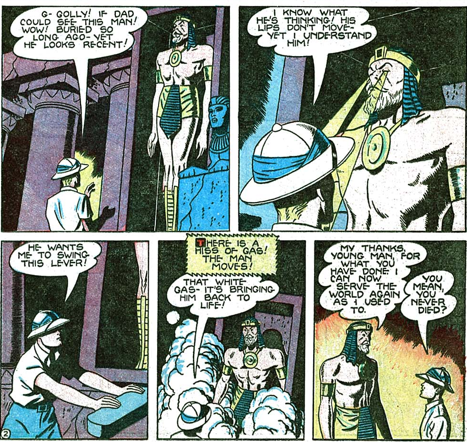 Again, later continuity would demand that this was Nabu, rather than Dr. 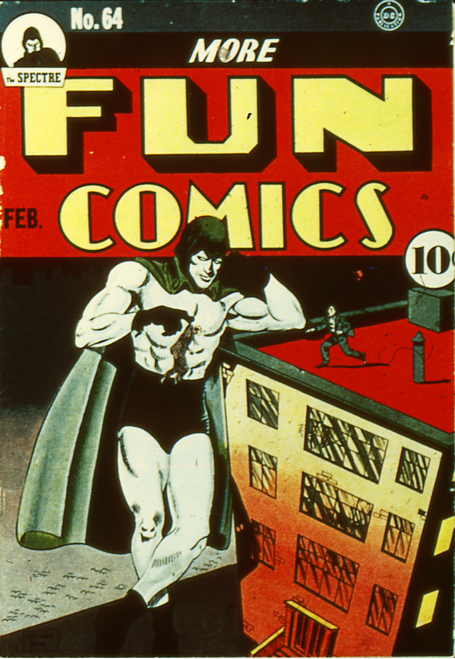 Fate, who was Mayoor’s opponent. 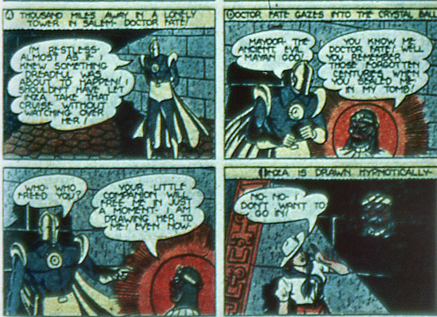 Mayoor entices one of the other people on the expedition into working with him against Fate, but the doctor is forgiving about that. Not so when it comes to Mayoor, who he incinerates. It’s a shame that Dr. Fate is so murderous with his enemies, as this one could easily have made a return. 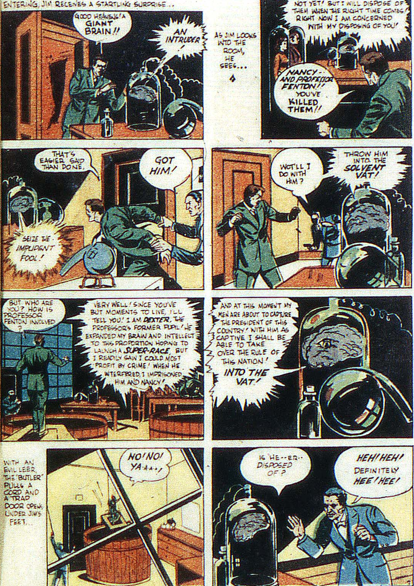 Jerry Siegel and Bernard Bailey pit the Spectre against a deadly brain in a jar in More Fun 62 (Dec 40). 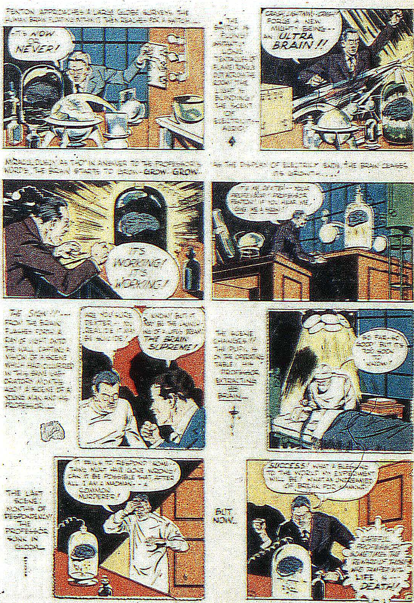 Professor Fenton has been working with the brain of a former pupil who died, keeping it in a jar and experimenting with it, creating an Ultra-Brain. 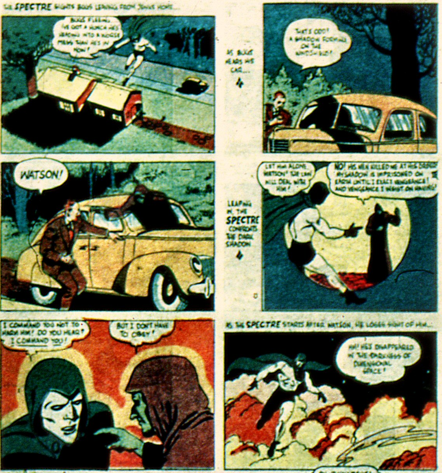 The Spectre gets involved when the professor’s daughter is almost run of the road. 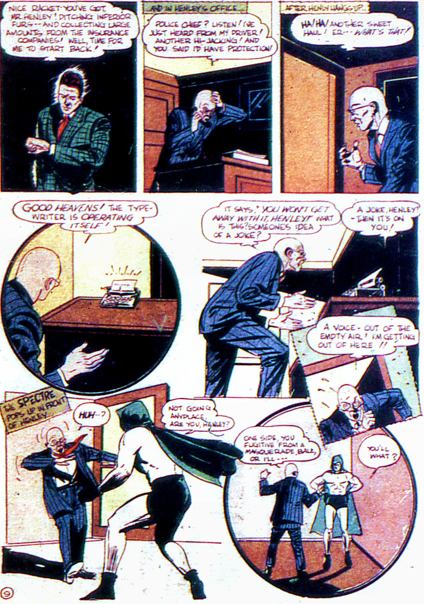 Jim Corrigan saves her, but finds the professor paranoid and secretive. 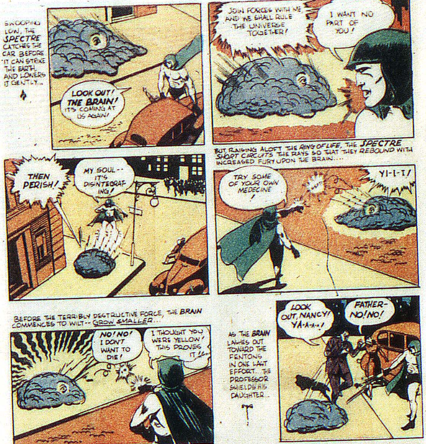 When he finds the Ultra-Brain, he learns its destructive plans. The Brain gives commands to a gang of thieves, leading a crime spree through the town. The professor eventually realizes what he has created, and tries to kill the brain by shattering the jar. This simply frees it, and the gray gelatinous mass begins its own “rampage” through the streets. Once again, an event that challenges Bailey’s art. In true horro movie style, the professor sacrifices himself to stop the brain and save his daughter. 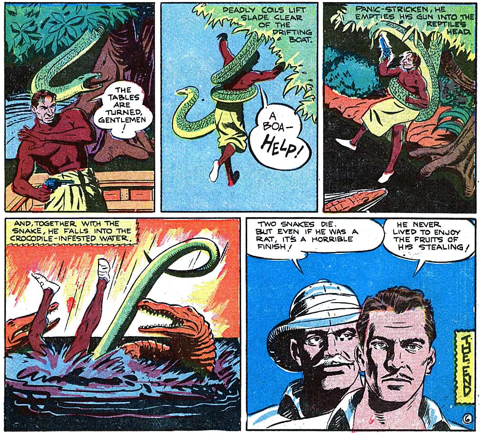 Congo Bill and Professor Kent find themselves running out of money in this story. 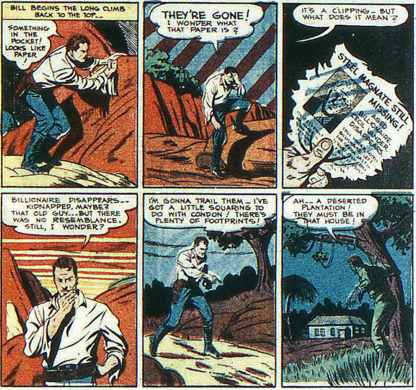 A situation one rarely finds in comic books, from any period. 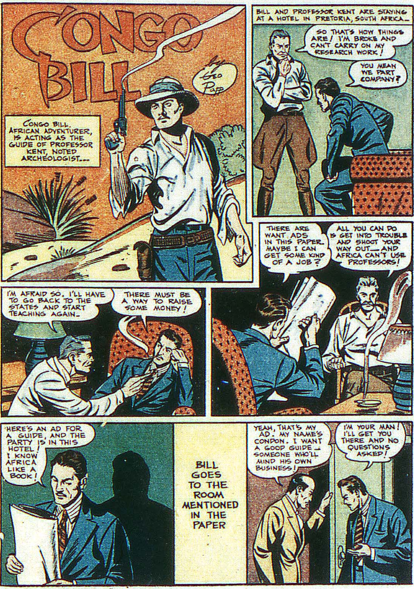 Bill takes on a job as a guide (which he does in many other issues as well, without the money troubles). This leads to a brief but complex adventure involving a missing steel magnate and a kidnapping ring. Of course, Bill saves the day. In the final panel, Congo Bill is rewarded by the entrepreneur with a cheque for $20,000. Quite a fortune in 1940. Makes you wonder why he ever went back to being a guide. 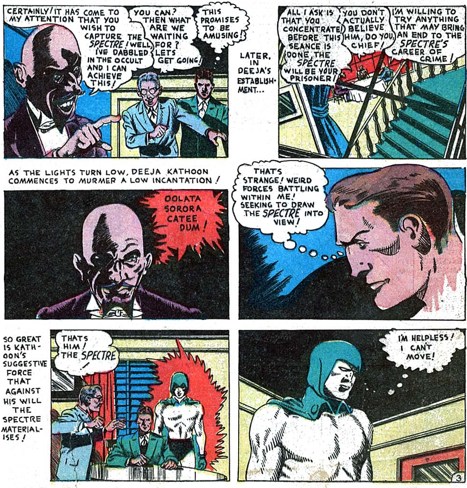 Gardner Fox and Howard Sherman give Dr. 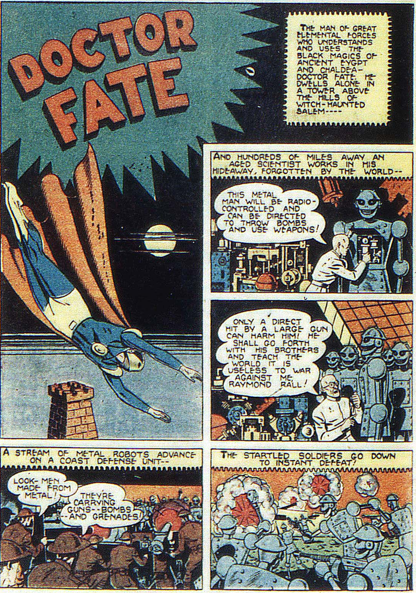 Fate more science-fiction foes in this story. It’s curious how many non-supernatural enemies Fate is pitted against in the early days of his series. In this one, it’s a mad scientist with a small army of robots (or Metal Men, as the story tends to call them). Fate interrupts the electrical controls for the robots, and leads them into the water to rust away. He then casually burns the mad scientist alive. 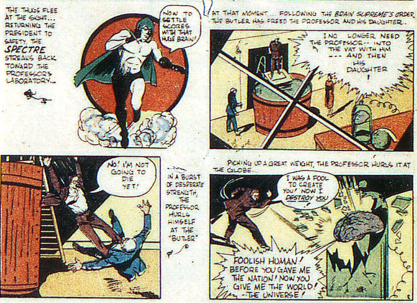 The Spectre gets a really good enemy in More Fun 60 (Oct 40), written by Jerry Siegel with Bernard Bailey art. 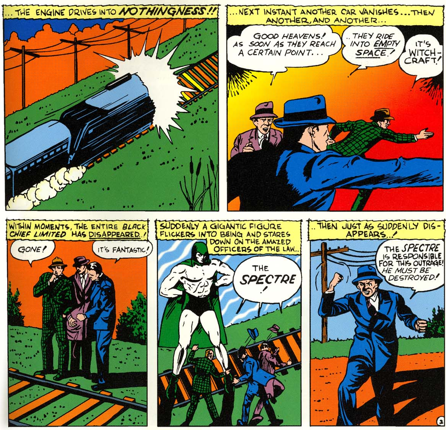 The story begins with a train carrying a cargo of gold vanishing, and the Spectre being seen at the site, even though Jim Corrigan knows his alter-ego was not involved. 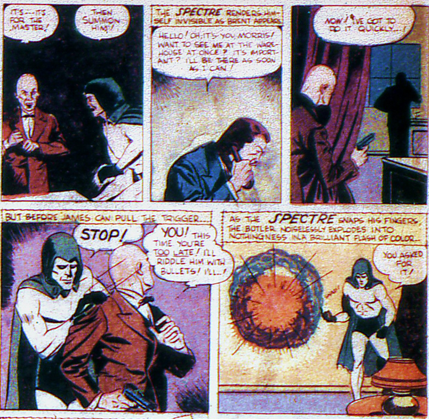 Framing the Spectre is a gutsy move, you have to admit. He pursues the case, and finds two criminals connected to the robbery, whose car disappears. 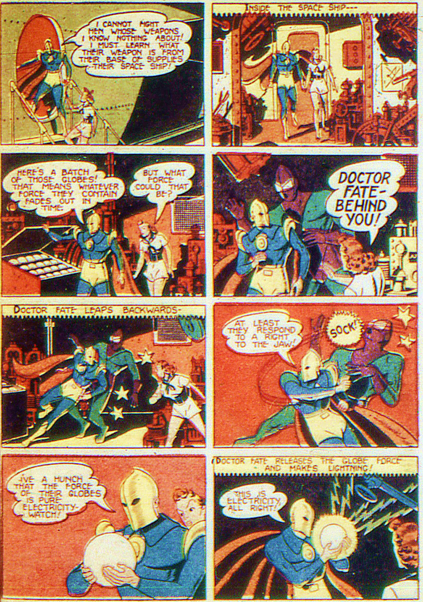 The Spectre follows it to another dimension, and meets Xnon, a scientific genius who rules with an iron fist. I love the little note at the bottom of the page giving the pronunciation of the villain’s name. 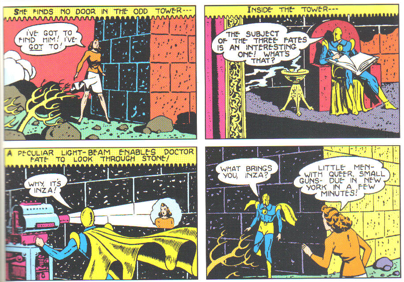 Xnon’s super-science is actually more than the Spectre can handle, which is fairly astounding consider the level of the Spectre’s power. The story also has the absolute best panel of art so far in the run, and he struggles to absorb Xnon’s attack on Earth. 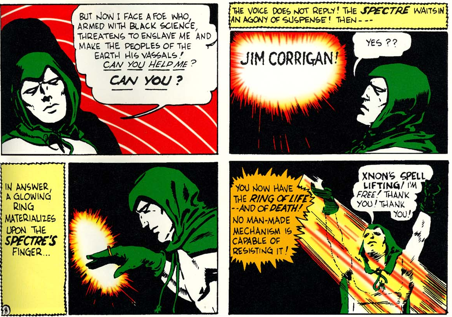 Turning to the Voice for help, the Spectre is given the Ring of Life (and of Death, but usually just referred to by the first part). 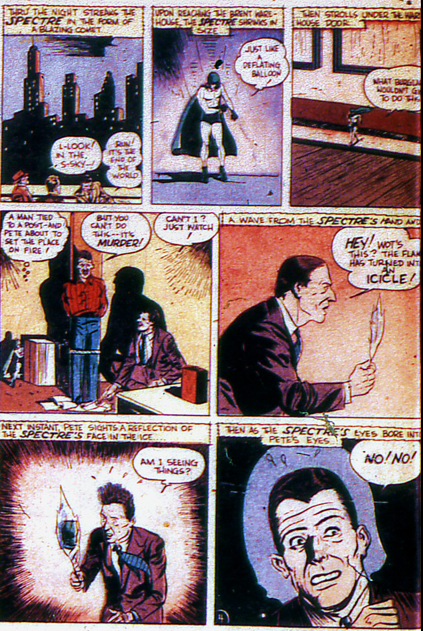 This ring would only appear in a couple of tales, and then simply dropped from the series, although an explanation for its disappearance would be told many years later in All-Star Squadron. 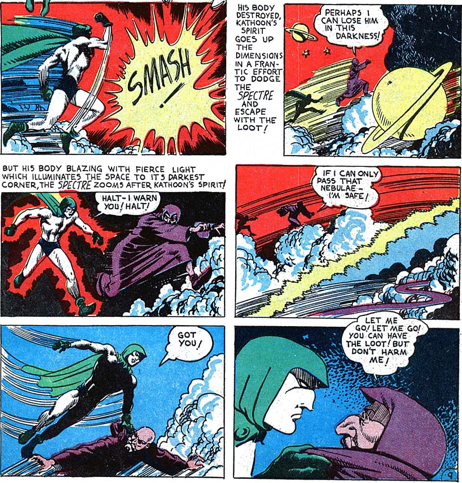 Using the Ring, the Spectre manages to defeat Xnon and imprisons him within a comet, another cosmic event that challenges Bailey’s art. It’s a real shame that Xnon never has appeared since. 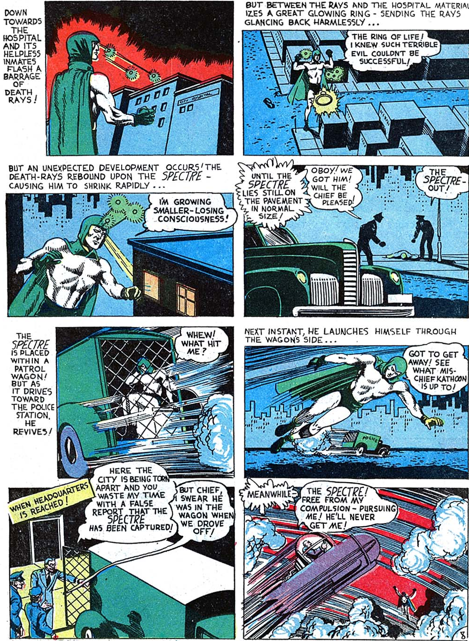 It’s a rare villain that can best the Spectre, even briefly. They come across her father, also a captive, but with no memory of himself or his daughter. 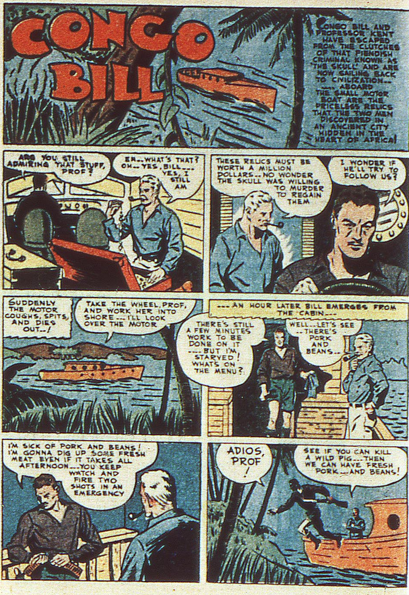 Bill escapes and saves the day, and the father bangs his head and regains his memory. Despite the passionate embrace that ends this story, Gloria Desmond (and her father for that matter) do not return in any later tales. Congo Bill must be a “love ’em and leave ’em” type. 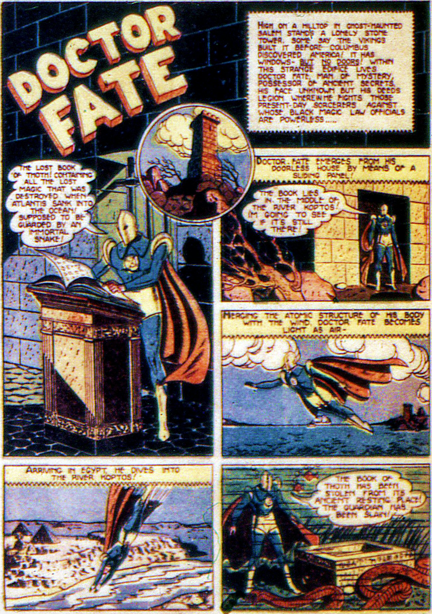 The Dr.Fate story in this issue, by Gardner Fox and Howard Sherman, opens with Inza discovering a ship of very tiny men, who are able to cause massive amounts of destruction despite their size. We also get to see Fate’s tower in more detail, as Inza attempts to enter, but can find no door in the structure. Dr. 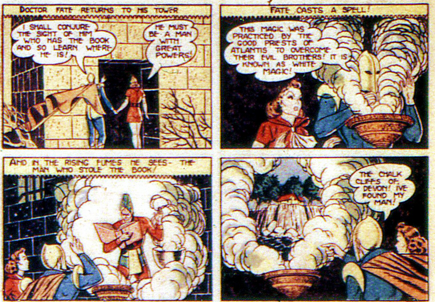 Fate uses an unusual device to see through the walls of the tower. In later stories he will be able to do this on his own. He can also pass through the wall, using his own abilities. Dr. Fate defeats the tiny men, stopping their destructive rampage, and uses his powers to trace their origin, deep in the Catskills. It turns out they were created by a race of giants, living deep in a cave. Fate wipes these guys out as well, shooting magical fire. Finally a foe he defeats using magic, rather than just punching them. 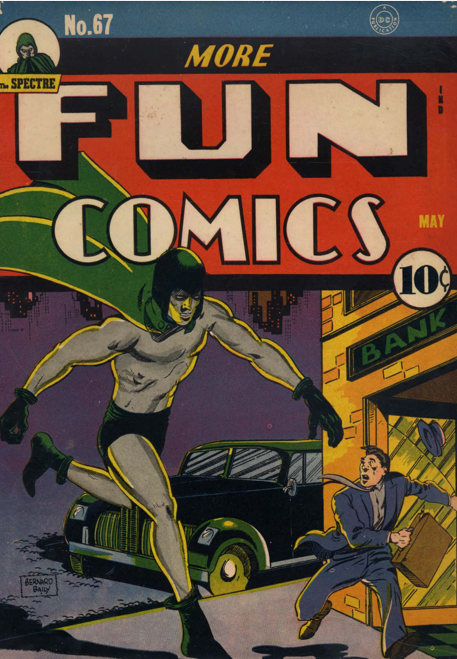 Jim Corrigan gets put onto the case when a number of fur shipments get hijacked, and the Spectre wreaks vengeance on the evil-doers in this Jerry Siegel/ Bernard Bailey tale from More Fun 59 (Sept 40). 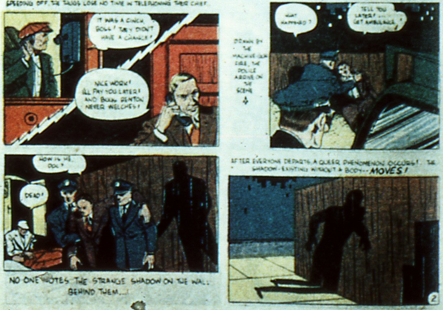 The art is a bit more innovative, playing with the panel lay-out. 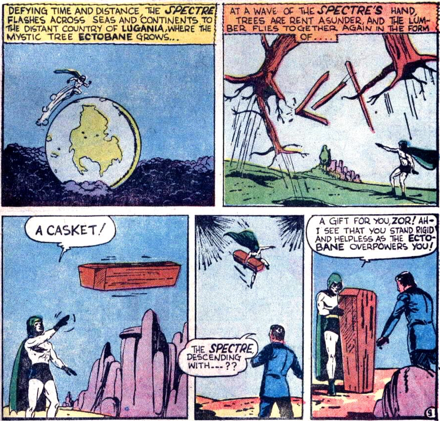 The Spectre takes one of the hijackers far into space, where the poor guy just gets “lost in a dimensional current,” and never returns. Ultimately it turns out the whole thing is an insurance fraud. 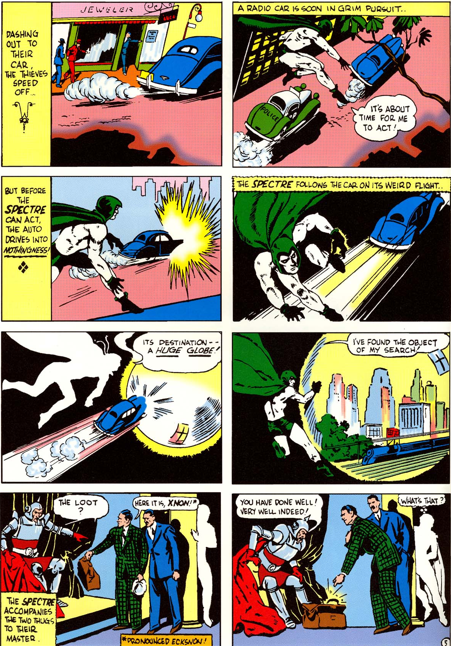 Never a good idea to have the Spectre on the case when you’re lying to the police, but the guy behind it does actually survive the story. 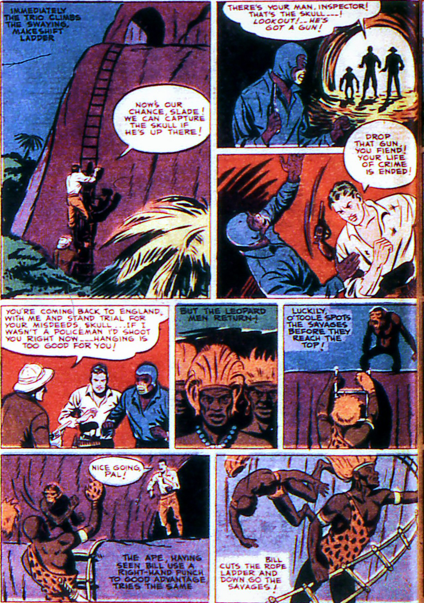 The Congo Bill series has avoided some of the pitfalls of racism so prevalent from this period, but once Gloria Desmond shows up, asking for help in searching for her lost explorer father, that comes to an end. 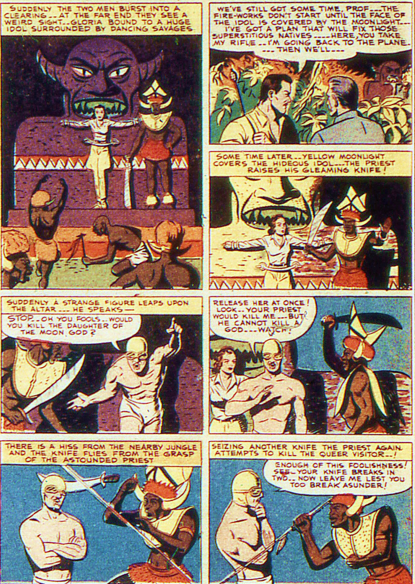 And there’s some strong sexism as well, as Gloria gets distracted by a monkey and wanders off, and into the hands of evil Africans who want to torture white women. 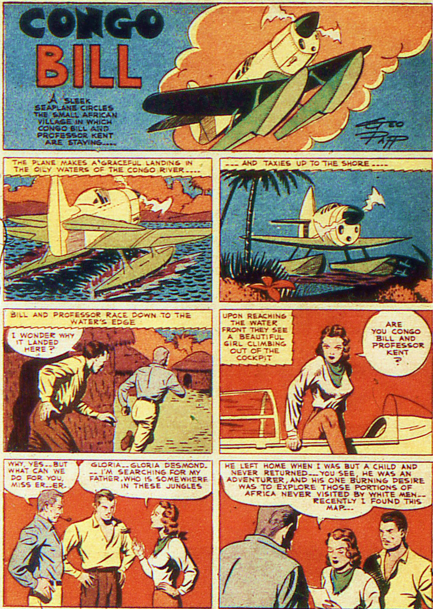 As she, Congo Bill and Professor Kent fly off to begin the search, we also get another little detail of Bill’s past, that he flew during World War 1. Presumably somewhere in Africa, considering his earlier statement about living there his whole life. 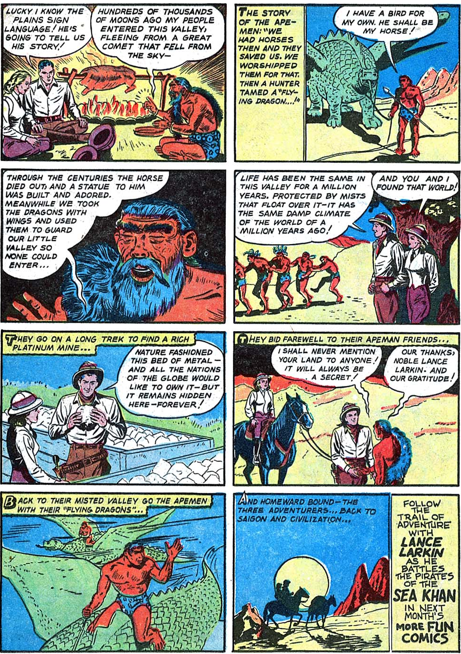 The story culminates with Bill in disguise, convincing the Savage Horned-Tondurs that he is really a god. One of those white gods, you know. They free Gloria, and leave the natives behind, as the search continues in the next issue. 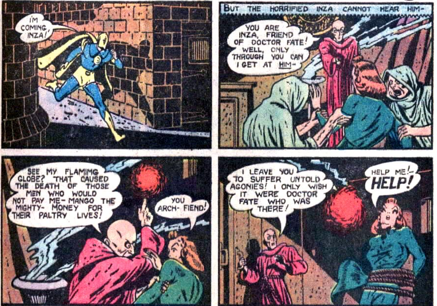 Gardner Fox and Howard Sherman pit Dr. Fate against alien invaders in this story, a dramatic change of pace for the series. Dr. Fate brings Inza along as he investigates the spaceship. The interior looks quite different than one would expect – kind of cluttered and messy. And not very hi-tech. 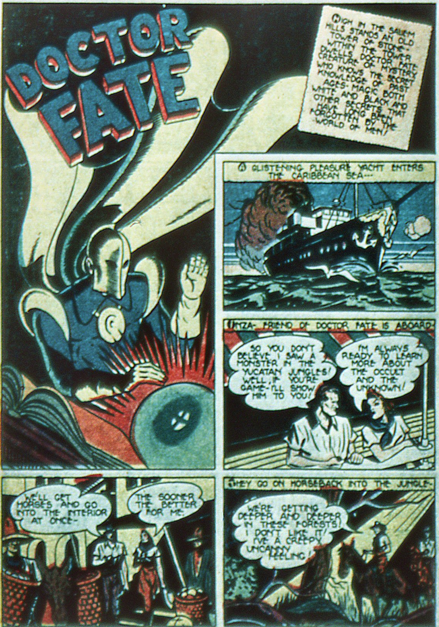 Fate uses his powers to destroy the ship, but his fists to take down the aliens themselves. His “nine-pins” bowling reference seems a bit out of character for such a mystical being. 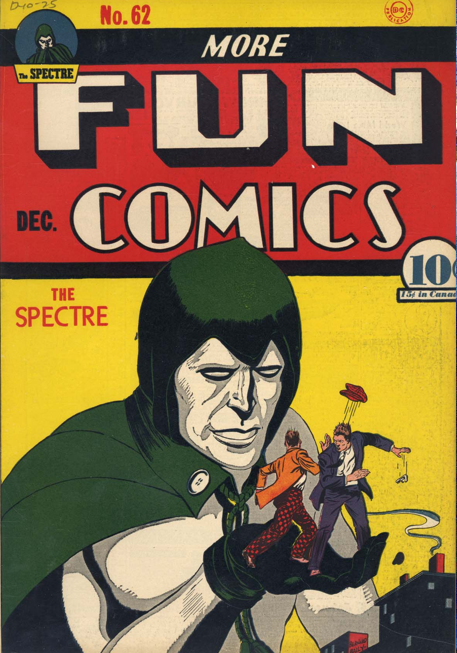 The Spectre story in More Fun 58 (Aug 40) has little to it, other than violence. 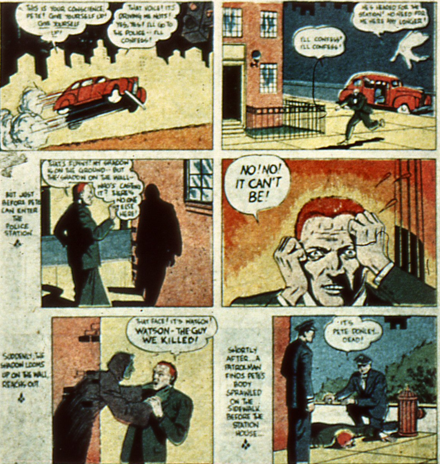 Jerry Siegel and Bernard Bailey craft this tale, of a warehouse owner victimized by mobsters, although in a way it’s the mobsters that are the victims here, of the Spectre’s wrath. 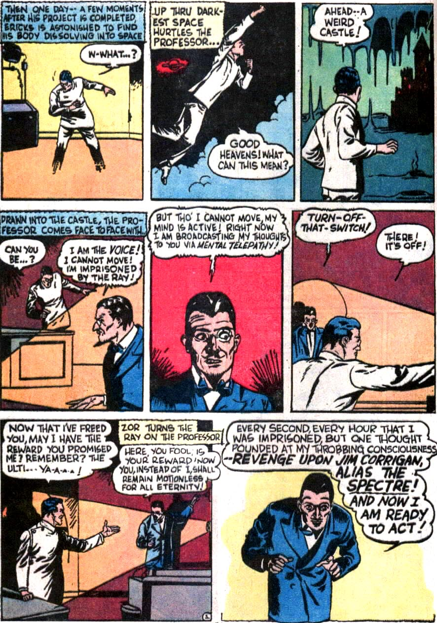 The betraying butler dies in a burst of fire, caused by the Spectre doing little more than wishing it to be so. The rest of the gang are hurtled into the sky in their car. Perhaps it’s a good thing that Bailey’s art is not more explicit, I can imagine this series giving children nightmares. There are other, scary, tribesmen, who wear leopard skin robes, and prove more of a danger to Congo Bill, and the inspector, and even to the Skull. 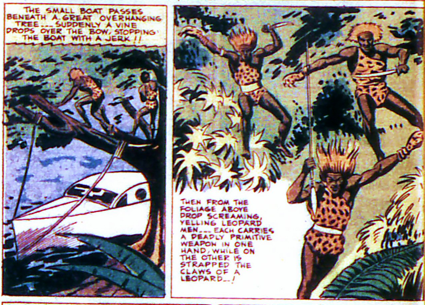 In the end it’s the chimpanzee, O’Toole, who gets the best of the Leopard Men, allowing the others to escape. This is the Skull’s last appearance, which is a good thing. It would be hard to continue to view him as a threat after he promised to buy O’Toole a bunch of bananas as a reward for saving him. 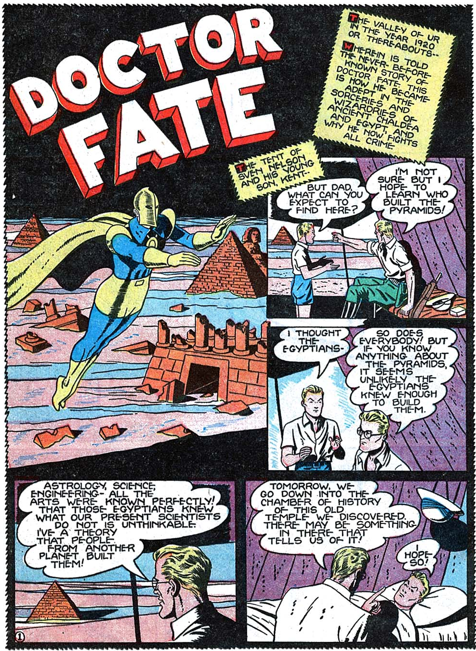 We get to see Dr. Fate’s mysterious tower home in this tale by Gardner Fox and Howard Sherman, though really only as an inset at the start. Dr. Fate and Inza discover that an ancient Atlantean book of spells, the Book of Thoth, has fallen into the hands of a British magician, who has been using it irresponsibly. They pursue him, and he uses the book to bring trees and animals under his control, to battle Fate. The climax is a bit of a let-down again, some physical fighting, and Fate grabs the book from the man, who simply falls to his death. 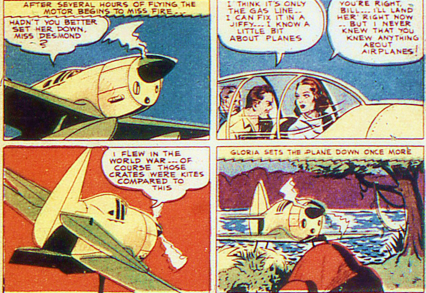 Interesting mention of “atomic power” at the end (remember, this is 1940, long before the first atomic bomb), which Dr. Fate uses to destroy the book. And cause lots of fish to die. I feel really bad about the fish, although neither Fate nor Inza seem much concerned. Kind of a shame that the book was destroyed, it could have easily served in more stories. 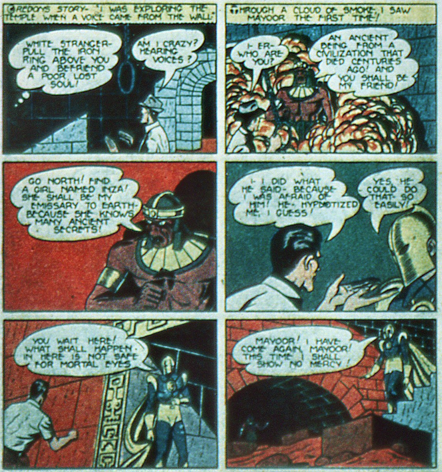 Zor makes his second, and final, golden age appearance in the Spectre story in More Fun 57 (July 1940), by Jerry Siegel and Bernard Bailey. He lures a scientist into freeing him, and then sets out for vengeance against the Spectre. Once again, he kidnaps poor Clarice Winston. The girl just can’t get a break. 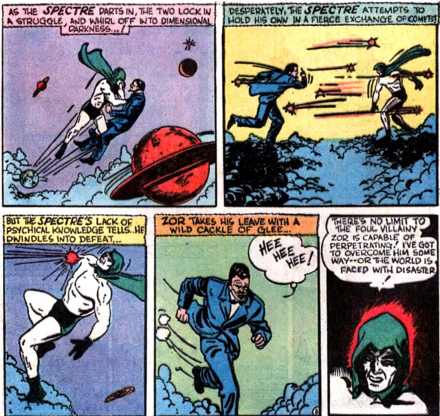 The battle between Zor and the Spectre goes cosmic, as they grow to giant size and hurl stars and planets at each other. Sadly, Bailey’s art is just not up to the challenge of this. It’s not that it looks bad, just not as mind-blowing as the events it relates. 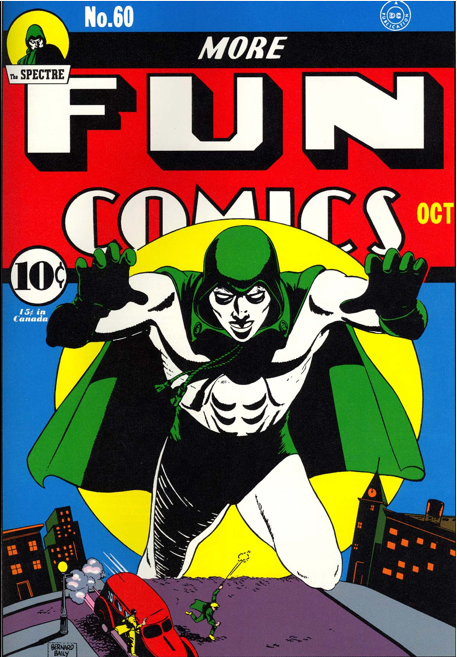 The Voice informs the Spectre that Zor can be defeated using “ectobane,” and the Spectre hurtles around the globe looking for it. At least, I assume that is meant to be our planet. Bailey also might have wanted to consult an atlas, and is apparently unaware that North America and South America are joined. Zor has sent the bound Clarice over a waterfall, but the Spectre displays yet another amazing power, reversing time, to save her. 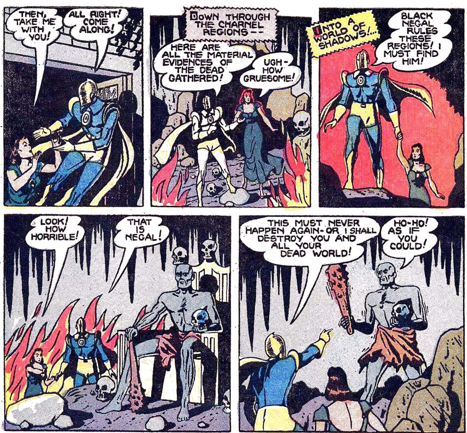 Zor does not return until the 1980s, in an All-Star Squadron Annual, which is a shame, as it is clearly not easy to go head with head with the almost omnipotent Spectre. 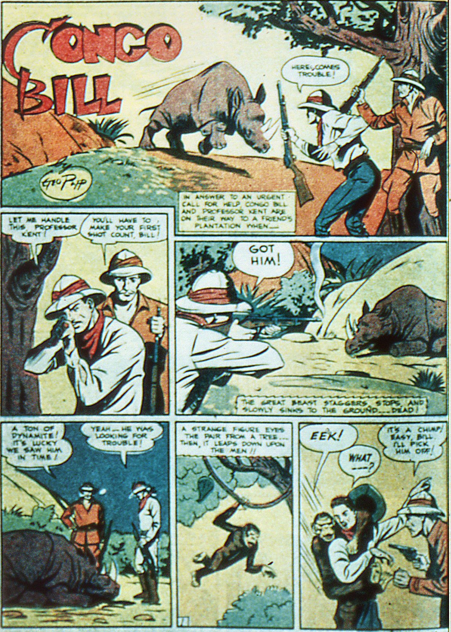 Conge Bill’s second outing is also a revenge tale, as the Skull kidnaps Professor Kent. 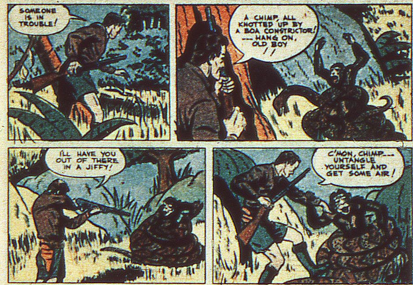 While tracking his buddy, Congo Bill comes to the aid of a chimp being attacked by a large snake. 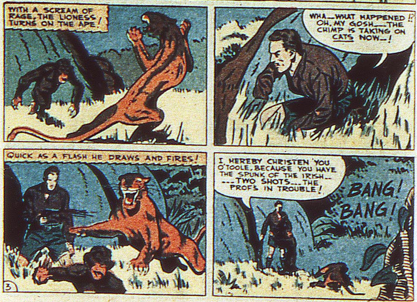 No sooner has he freed the chimp than a lioness attacks him, and Bill once again saves the creature, naming him O’Toole. Because being attacked by two wild animals in the space of a few minutes reminds Bill of Irish people. Somehow. Perhaps that says something about the Irish people Congo Bill has come across in Africa. 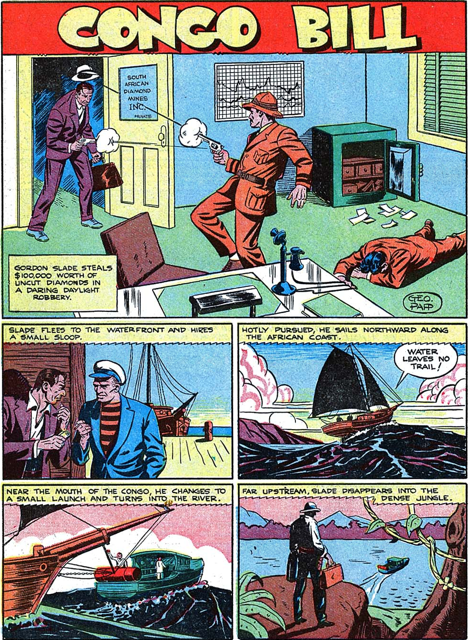 Congo Bill and O’Toole then rescue Professor Kent, and sail off, leaving the Skull behind to fume, and plot another revenge, which comes in the next issue. The Dr. 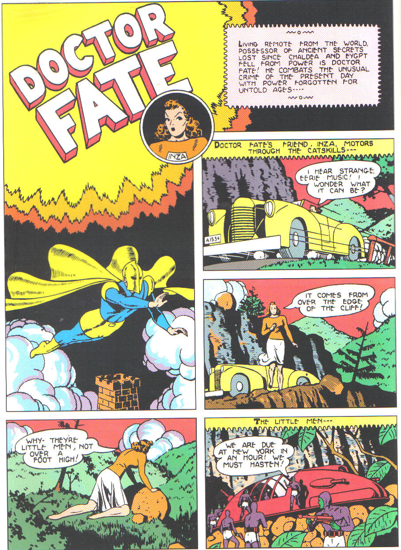 Fate story, by Gardner Fox and Howard Sherman, once again is carried by the art rather than the plot. After a number of people are found mysteriously burned, Dr. Fate, the master of knowledge, turns to Inza, society girl, for insight. 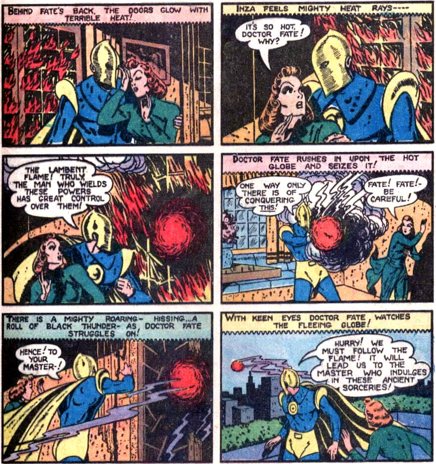 Mind you, it’s a good thing that he does, as a burning ball of fire, the “lambent flame” shows up trying to incinerate her.